In 1614 Dutch explorer Adriaen Block sailed along the Connecticut coast and up the Versche (Fresh) River—the Dutch name for the Connecticut River—as far as what is now Hartford. In 1633 the Dutch established a fortified trading post there. It was called the Huys de Hope—the House of Hope. For decades there was conflict between the Dutch in New Netherland and the English who came to settle in the same area. In 1650, the Dutch finally gave up their lands in Connecticut to the English. How did the physical geography of New England affect how the colonies developed? What resources were available in the different colonies and how were those resources used? How did the colonists’ use of natural resources and establishment of permanent settlements affect the indigenous people of the region? Why were the New England colonies focused on trade? In what ways, and for whom, was America a land of opportunity during the 1600s? 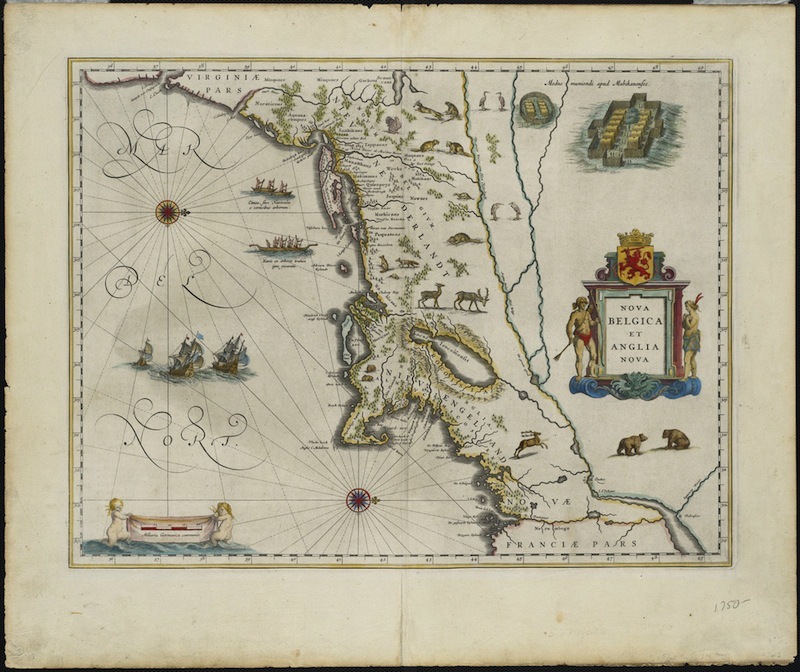 Willem Blaeu (Dutch), Nova Belgica et Anglia Nova, 1635 – This map is held in the collections of the Connecticut Historical Society and the Norman B. Leventhal Map Center at the Boston Public Library. This map was based on a map drawn by Adriaen Block. It is oriented with west at the top. The map shows “Nieu Pleimouth” (Plymouth) and the Noord (North) Rivier (today called the Hudson), as well as the Versche (Fresh) River. It also includes images of native animals (probably never seen in real life by the artist), examples of Native American canoes and fortified villages, and European-style sailing ships. Nicolaes Visscher (Dutch), Novi Belgii Novæque Angliæ, 1685 – Library of Congress, Geography and Map Division. This later map features some of the same pictures and details as Blaeu’s map. It also includes the Fort de Goede Hoop (another name for the House of Hope) and some English settlements, such as Herfort (Hartford), Gilfort (Guilford), and Watertuyn (Watertown). Using the Library of Congress’s Primary Source Analysis process, give students time to examine the first of the two maps, and ask them to OBSERVE, REFLECT, and QUESTION. Observe: Describe what you see. What do you notice first? What information does the map provide? What geographic elements are included? Which way is north/south/east/west, and how do you know? What places are shown on the map? Are there words on the map? Pictures? What are they? Reflect: Why do you think this map was made? What do you think was important to the people who made this map? Does the map give us any clues about the time in which it was made? Repeat with the later map and have students compare and contrast. You may then choose to address some of the supporting questions (above) or focus on the questions that students have developed as part of their inquiry. 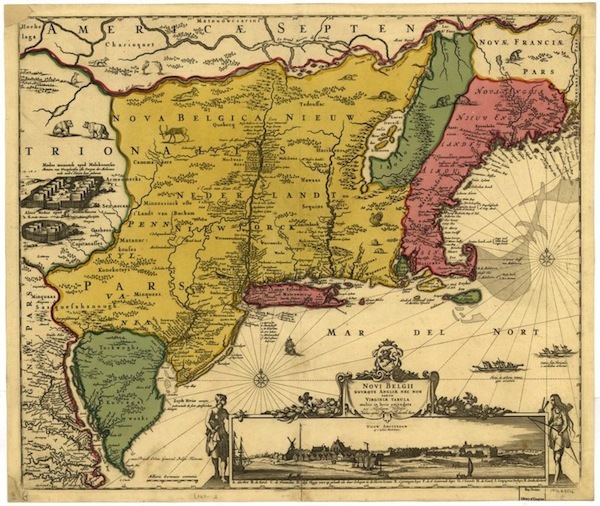 Using evidence from the historic maps, as well as additional information gathered through readings and classroom discussions, students will make their own map of Connecticut showing the natural resources that attracted European colonists to the area. Start with a blank outline map like this one. Have students draw in major rivers and hilly regions, and then add simple images for fish/shellfish, woods/timber, beavers (for fur), other native animals, farmland, etc. in appropriate areas of the map. Using evidence from the historic maps, as well as additional information gathered through readings and classroom discussions, students will imagine that they are sailors on Adriaen Block’s ship, the Onrust, during its exploration of the Connecticut coast and the Fresh (Connecticut) River. They will write fictionalized letters home to a loved one in Amsterdam describing their experiences and observations.